I decided to ground my reflection on the frontiers of digital work on religion in a discussion of two publications that have emerged over the past year that both seek to bring science writing to new publics.1 I chose these two publications not because I think these publications are “the most exciting and productive” examples of such work – they may or may not be – but because they appear to make interesting case studies of work being done to bring together digital media and religion. The two publications, Aeon and Nautilus, are, as I mentioned, science publications, but both are set up in a way that ensures religion is among their chief areas of interest. I will introduce both of them before briefly reflecting on what they seem to indicate about such work and the directions it is headed in. Aeon Magazine is based in London, where it is published by an editorial team of a dozen people, several of whom, before joining Aeon, had editorial posts with respected British and American publications, including the Daily Telegraph, the Atlantic, and the Los Angeles Review of Books. The magazine launched in late September 2012, and it is published online only and paywall-free. Each article is accompanied by original photography, and some are available as audio files. Lately the site has begun working with video documentaries as well. The founders are Paul and Brigid Hains, an Australian couple. Paul is the son of one the richest people in Australia, the hedge fund manager David Hains, whose net worth according to Forbes is two billions dollars. We believe that there is a need to find new ways to talk about the ideas, values and beliefs that make us tick. Recruiting insightful writers, with a deep understanding of their subjects is the best way to get that started. The first articles published by Aeon include an article on the New Atheism by the philosopher Michael Ruse and an article on Western Buddhism by the British writer Tim Lott. Recently Aeon also published a widely-read article by philosopher Graham Priest discussing surprising parallels between ancient Buddhist philosophy and modern Western mathematical logic. But the site also publishes on general themes in the social and natural sciences in which the element of values and beliefs is not as central. Articles are typically between 2,000 and 4,000 words in length, and the site enables smooth sharing out to read-it-later services. At least on the surface, capturing “eyeballs” does not seem to be the main agenda. I’ll return to this metamorphosis below. Our business model is to spend the first year or so investing significantly in the magazine in order to build up a strong following or community of interested people – readers, writers, artists and photographers. Once we have established that reach we will start to build opportunities for generating revenue. We are not sure what forms these will take and are watching closely how other publications are doing so – from micro-payments for articles, to higher levels of service for subscribers, live events, and online fora. This all sounds very Silicon Valley, and in fact, Aeon’s aesthetic and content appears designed to appeal particularly to techies. In December 2013, the magazine even switched over from aeonmagazine.com to its current .CO domain name, a recent favorite among tech startups. It seems to be working. 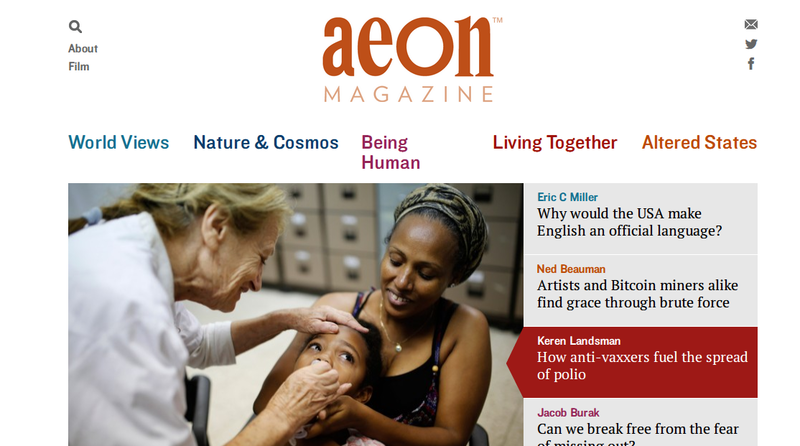 Tech start-up news site Pando Daily has described Aeon as “the best magazine on the Internet.” Aeon’s successes with geeks over the past year can also be seen on social sites such as Reddit or Hacker News. At the time of this writing, 23 submissions of articles from Aeon have received over 300 “upvotes” on Reddit, and twelve submissions to Hacker News have collected more than 50 points. Nautilus launched shortly after Aeon, and Toronto’s Globe and Mail saw the two as part of “the vanguard of a new and richer approach to science, one that is more immersive and thoughtful, and that sees science as a creative act rather than a mechanical algorithm we apply to generate facts.” The New York City-based Nautilus does in fact have much in common with Aeon, but a big difference between the two is that Nautilus also publishes a print version called Nautilus Quarterly. The online version is organized into monthly issues on a single topic; a new “chapter” is added to the current month’s issue weekly. According to a press release, the editors came to Nautilus from “NBC, Nature, Discover, Psychology Today and Palgrave Macmillan.” Unlike Aeon, Nautilus boasts a list of advisory board members that features academics from several major U.S. universities. Nautilus is every bit as elegant as Aeon, if a bit more cluttered. The site’s typography eases reading the articles which average well above 2,000 words in length. The use of a domain hack (nautil.us) mirrors Aeon’s use of the .CO domain. However, judging by social signals, Nautilus has not been quite as successful at building an online audience as Aeon has. Only seven submissions on Reddit have received over 300 “upvotes,” and only ten submissions on Hacker News have gotten 50 or more points. Nonetheless, most aesthetic choices. Aeon co-founding editor Brigid Hains said in an interview that “the digital space offers a fluidity and reach that cannot be matched in print for a new magazine like ours.” Both publications embrace the promise of digital space by trying to make themselves as much at home in a mainstream conception of digital culture as possible. This is evident at an aesthetic level as well as in the bleeding-edge technologies that both sites use. 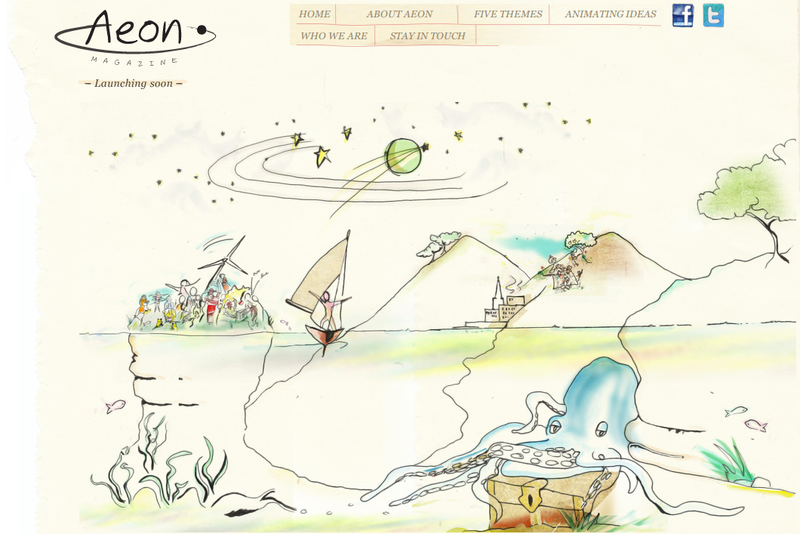 Aeon’s initial design pointed in a different direction, but it has come around to the standards of user experience expected in an age of mobile web apps. What all this suggests to me is a continuity between counterculture and cyberculture. Fred Turner has traced how cyberculture (seemingly) came to realize the countercultural hopes of building alternative communities and crossing new social frontiers. (Stewart Brand of The Whole Earth Catalog is an important player in this story.) In addition to this aspect of counterculture, the cases of Aeon and Nautilus indicate that the countercultural, new-age dream of integrating science and religion is also being made a reality by cybercultural productions. The grasping search for viable business models – and the seemingly boundless availability of startup funds for tech ventures – is enabling inventiveness not just in the form but also in the content of digital publications. As such, they appear, at least for the time being, to have the capacity to break down old epistemological conflict narratives.